Love Charms, a Sufi poem/kafi by Bulleh Shah painted by by F. Zahra Hassan (text and painting from an album produced in 1997 in London. With love charms, O friends, I shall win over my Beloved. This charm I shall recite and waft: with sun fire burn it. I shall kindle the blaze. Tranformed into clouds, will come crowding down. Sun-fire I will cast them. I am neither married nor a maid, yet I will mother a babe in my lap. I will sound my horn. This, it must be said, is one of Bulleh Shah’s rare poems in which the language is not as simple as usual. 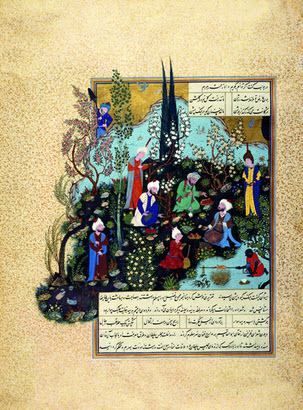 He is narrating in the first person as the female Lover and in the last verse she succeeds in wining over the Beloved. This is symbolic of the marriage of the individual should (herself, the Lover) to, the universal Spirit, “I will deem myself wedded~” The union between husband and wife is when the poet realises his Divine Ideal of losing his ego in God. His communion with God results in ecstasy, bliss and the highest spiritual happiness and the “babe in his lap” is the fruite of his union, a spiritual child or gnosis (Marifa). The poet is an unmarried lady in this poem, and symbolically she is the love of her Lord. “Sitting in the courtyard of the Houseless” is an awkward translation and in fact in Punjabi Bulleh Shah writes “peen”, which means throne or platform. “Peeri, is the highest spiritual station and when reached the blessed traveller is able to listen to eternal song which is sung by the soul.